Pogies are giant mittens that go on the handlebars of bikes to allow the user to wear light gloves but still work the controls and not freeze their hands. They are a not necessity for winter cycling but they sure are a great way to keep hands warm. If you know how to sew, you can make pogies and have toasty warm hands on your bike this winter. For those who don’t ride their bikes in the cold, pogies might not make sense, but they are probably the single most important piece of equipment for making me comfortable on the bike in the winter. 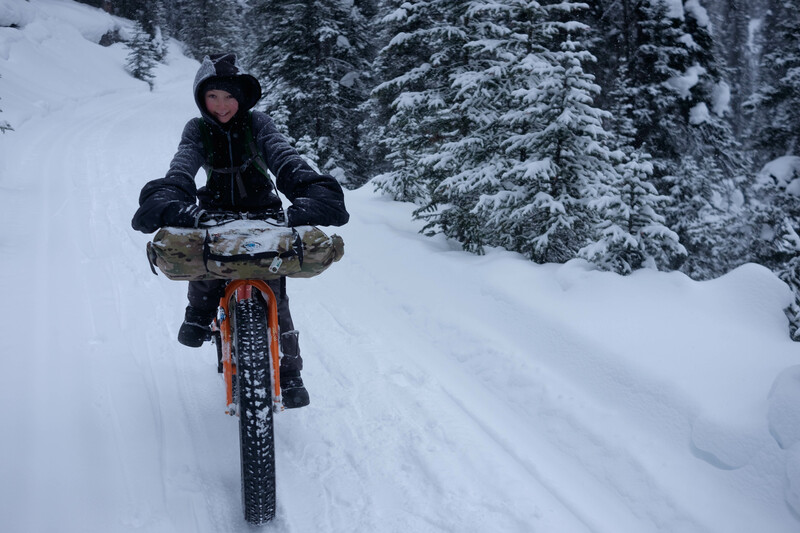 It is entirely possible to ride a bike in mittens, but brakes and shifters wear out mittens at a very quick rate. I would not go bikepacking in winter without them. For anyone who doesn’t care about making their own, or hearing my philosophy on making pogies, go ahead and scroll to the bottom or click this link to just buy some. How I started making them. 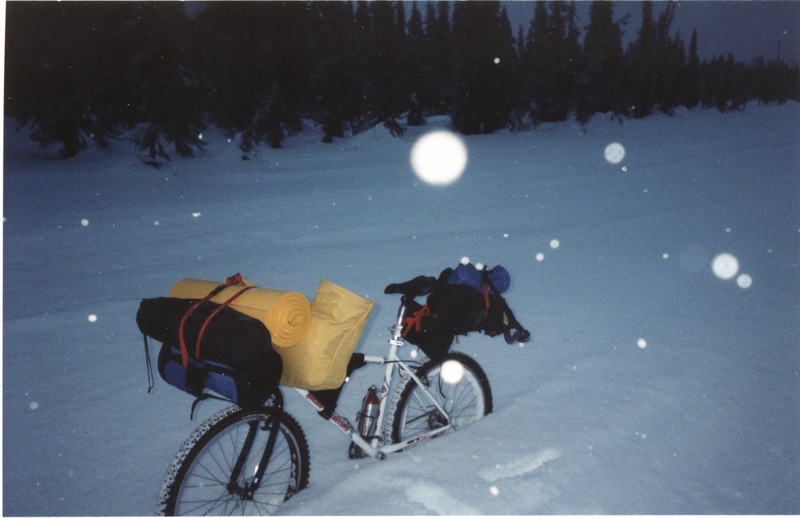 My second bikepacking specific item I ever made was a pair of pogies. At the time, there were few options in pogies commercially available, and I wanted some specific qualities. First I wanted them warm enough to keep my hands from freezing. Second, I wanted them to be roomy enough the I could fit some snacks thawed in them, third, I wanted them to serve extra duty as emergency booties. What I missed out on was the part where they would be better if they stayed better attached on the bars. Though they worked well enough, the outer edges would rotate outward unless I left the zip ties that I designed to hold the corner tethers in place. Unfortunately, the zip ties would rub on my hands causing serious wounds after a few hours. My ITI bike from 2002 – scanned from disposable camera film. How do you make them stay on the bars? There are a bunch of commercial solutions to the problem of securing pogies to the ends of handlebars. A very popular method is a velcro strap and tether. It works, but does not really address the issue that I had of my city-boy hands rubbing on the strap. It also does not do an ideal job of securing the pogies. My favourite way to secure pogies is a bar plug that clamps the pogie to the end of the handlebar. Conveniently, Tadhg took up 3D design and printing just as I was trying to work out how to modify some off-the-shelf bar plugs to work with pogies. He has refined the design enough now that a pair of his clamps comes with all the pogies I sell. One of the big advantages of home-made gear is that you can modify it easily, or at least easilyish, if it doesn’t do what you want. I modified that first pair of pogies several times, and I still have them, they now use a plug in the end of the bar to keep the pogies on. The number one issue I have had with them is that they can fill up with snow if I leave them on the bike without rotating them downward. They were, however designed to be used as booties when they are off the bike. I have not made any more pogies that fill with snow. As time goes by, my preferences change, and many things that I liked about the first set of pogies were not what I ultimately wanted, and so I have tried several other styles over the years. Upcycled Children’s Jackets as Pogies. I have made many pairs of pogies from children’s size 12 to 14 jackets where I simply hem the cuffs, turn them inside out, sew each side of the zipper to the back of the jacket, cut them in half, and voila, a pair of pogies. They are warm reasonably light, and aren’t too expensive to make. They are not the most attractive pogies, but they are simple, warm, and are reasonably light. I still have several pairs of these in my collection (how many people have enough winter cyclists and winter bikes in their family for a pogie collection?) and they are great for around town and even for longer trips. Several of my pairs of this style don’t have mounting holes in the sides, so they are quicker to install and remove than the newer style that I make. They are a great first MYOG project, and I can definitely endorse finding a relatively simple style of kids jacket in roughly a size (US age sizing) 14 and making it into pogies. When I first started selling pogies, I made them by upcycling children’s jackets with faulty zippers. These eventually became harder to source in sufficient quantities, and I eventually decided to make my own design of pogies from scratch. My experience had shown me by then that I wanted several things in pogies. First was simplicity. I have made pogies with complicated vent systems, food thawing pockets (it is exceedingly difficult to eat things that are frozen to -30ºC), storm cuffs, and a number of other “features”, but I gravitate toward simple styles. My preferred style for the last few years has been a simple shape with roomy hand area, longer arms (to keep the blood warm on the way to your hands) and enough stiffness to help me get my hands in but not so much that they face upward and get filled with snow in a storm. They are fleece lined, which is comfortable and reasonably warm, they are large enough to fit a couple of snacks in the bottom for thawed food. I encourage people to make their own pogies, but people have lives. Not everyone wants to make their own, and not everyone likes sewing as much as I do. Some sewing machines won’t punch through the materials well enough to make pogies. For this reason, I sell my own pogies on this blog. Feel free to buy some, also feel free to ask me questions about building your own. 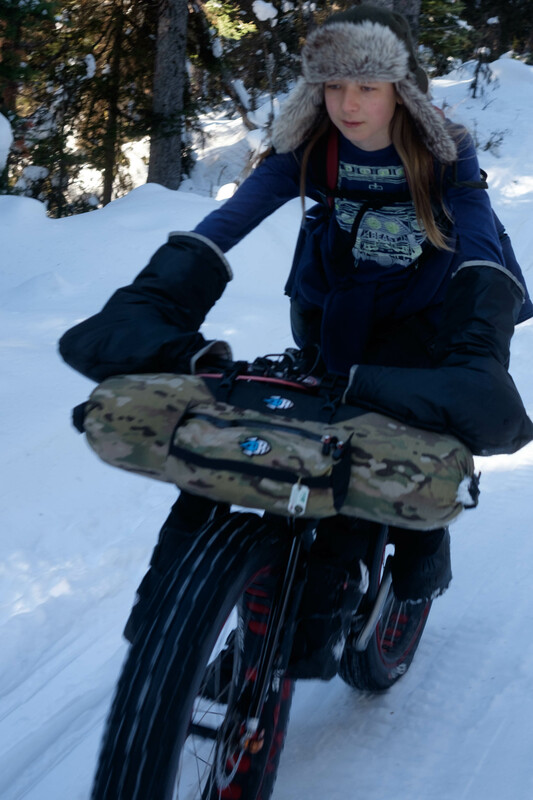 Since I am not only a winter bikepacking nerd, but also a dad, I of course make the pogies in smaller sizes for kids (or anyone with smaller hands).